The Jackson Symphony Orchestra has a rich and vibrant history serving the Jackson area since 1949. The orchestra has performed with many legendary figures in the world of music including Dizzy Gillespie, Grant Johannesen, Ralph Votapek and Ian Hobson. Mannheim Steamroller, Ann Murray, and the Manhattan Transfer have invited the orchestra to do multi-state regional tours with them. The repertoire of the orchestra has been adventurous (including two entire seasons where every piece performed was from the 20th Century) and has drawn national attention as evidenced by frequent grants from the National Endowment for the Arts. The orchestra has premiered works by such distinguished composers as Jeff Beal, Crawford Gates, David Gibson, Robert De Gaetano, Falla Guitar Trio and it’s own composer in residence, J. Bruce Brown. Operas including Tosca, La Boheme, Merry Wives of Windsor, Die Fledermaus have been presented in fully staged productions and eight different collaborations with the Indianapolis Ballet and Grand Rapids Ballet have resulted in magical productions of Sleeping Beauty and Nutcracker. Be one of the most innovative, inspiring and successful music arts organizations in Michigan. Enrich our communities by providing superior performance, listening and learning experiences in a variety of settings. A passionate advocate for American and contemporary music, Dr. Matthew Aubin has conducted and performed internationally from Carnegie Hall to the Musikverein and many stops in between. 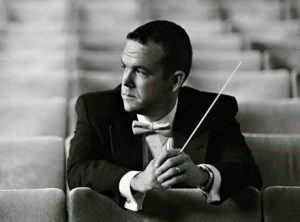 Currently in his second season as Music Director of the Jackson Symphony Orchestra, Dr. Aubin also serves as Artistic Director for The Chelsea Symphony in New York City. In this role he has significantly expanded the symphony’s prestige and recognition through highly visible projects such as collaborations with the Golden Globe award-winning television series Mozart in the Jungle and the Natural History Museum in New York City. Dr. Aubin has played a principal role in the initiation and development of The Chelsea Symphony’s annual competition for emerging New York area composers with high profile adjudicators such as Conductor Laureate of the Seattle Symphony and music director of the All-Star Orchestra, Gerard Schwarz. Dr. Aubin has led TCS in their Lincoln Center Debut and conducted the New York City premieres of works by Mark O’Connor, Fazil Say and Caroline Shaw, among others. As a consultant for the Amazon Prime series Mozart in the Jungle created by Roman Coppola and Jason Schwartzman, Dr. Aubin was the off-camera conductor for an episode filmed on Rikers Island. As a result, Dr. Aubin designed and conducted a series of outreach concerts for inmates on Rikers Island through a continued relationship with the institution. Dr. Aubin is the foremost scholar on the French composer Fernande Breilh-Decruck. He has earned multiple research grants to study her significant life and work. A champion of the critical role of women in composition, Dr. Aubin is working to promote Decruck’s newly discovered lost music. He has edited and created critical editions of her work, which are now in the process of publication, and has organized performances of Decruck’s music in the United States and abroad. Dr. Aubin continues to be active as a freelance horn player, and regularly performs across the country. A devoted music educator, Dr. Aubin’s past associations include Assistant Professor of Music at Washington State University, Adjunct faculty at The Hartt School and Educational Programs Conductor for the Hartford Symphony Orchestra. The Jackson Symphony Orchestra is founded. The JSO is a strong regional orchestra performing 5 subscription concerts, 2 pops concerts, 4 chamber concerts, Jazz Night performances and numerous in-school children’s concerts annually. Principle performance venue moves from Jackson High School to Jackson Community College. The JSO moves into its own rehearsal/office space at the Commercial Exchange. The Community Music School (JSO CMS) is launched. The school was founded with two objectives 1) To provide quality private and group instruction on orchestral instruments for community residents; 2) To provide additional employment opportunities for orchestra members to attract and maintain quality players for the orchestra. Today, the music school instructs nearly 250 students and maintains a faculty of 16 instructors, most of whom are orchestra members. The JSO completes $1.4 million capital/endowment campaign. This provides a home for the orchestra in the center of downtown Jackson. The facility, made available by Comerica Bank at a favorable lease agreement, includes 11,000 square feet of rehearsal, office and studio space. Over 500 individuals attend weekly for lessons, rehearsals, concerts, classes, and community meetings. Babies in Tune The families of all babies born in Jackson County receive a complimentary CD and infant development instructional booklet developed and recorded by the JSO. After School String Programs for Children at Risk The JSO conducts after-school string programs for children in 2nd – 5th grades. Over 350 children participate; 50% are minorities. Home School Orchestra Children meet twice weekly at the JSO. Beginning and intermediate level small ensemble instruction is offered. Chamber Series We feature JSO resident musicians and offer classical, 20th Century and Jazz repertoires. String Academy Providing an intensive course of study for young musicians, admittance to the JSO string academy is through audition only. Private instruction is required. Summer Strings Camp/ Piano Camp Three week summer music offering concentrates on musicianship, playing, fun with music with peers, and small ensemble work. JSO Goes to School An umbrella program for in-school education providing a music education/concert experience for grade school students. 3,000 children served annually. JSO String Team Jump start group instruction for beginning string students. String Teams meet twice weekly in large and small group settings. Maestro Osmond celebrates 30 years as Music Director of the JSO. JSO Community Music School celebrates 15 years in downtown facility. Comerica donates building to JSO. A gift valued at nearly $1 million provides additional 16,000 square feet and is the catalyst for moving forward with a vision for the future. JSO Launches $4.5 million Capital and Endowment Campaign, Sound Vision. A new 5 week music education program, taught by Dr. Andrew Mead, Professor of Music Theory, University of Michigan, was sold out. New adult education classes are planned. A project of the JSO Youth and Music Committee hosted over 100 young people and their parents for a uniquely creative alternative rock concert in Weatherwax Hall. This event was designed by youth to provide a safe environment for young people to express themselves in music. JSO Chamber Concerts were redesigned to provide provide refreshments and a more intimate atmosphere for players. Attendance climbs significantly. During this 5-week program in three county schools, 4th and 5th grade students received visits from JSO musicians nad teaching specialists to explore music, instruments, composition and music history. Made possible through Campaign Program support. Selected 4th & 5th grade students meet twice weekly throughout the school year with a string specialist provided by the JSO, and includes movement for those who wish to continue to continue to the JSO youth orchestra programs. Pilot program offers “brush-up” group piano lessons for adult beginners and those with limited playing experience. Classes meet during the lunch hour or after work.